As I was going to church service this morning it was snowing and I saw on my way a man and his two little daughters throwing snow-packs while playing in the snow. I was intrigued and I stopped to watch a little bit. Unfortunately, the father-daughters snow game that had intrigued me and made me to stop, even though I was freezing out, came to an abrupt end when the younger kid fell on the ground and rolled down. She tried to get up but she tripped on the slippery snow and fell. Again, she tried and there she fell the second time. She wanted to have a third go but her sister hinted she should not, rather should wait for their daddy to come and get her. But their daddy, cracked up by the scenario, wanted his daughter to come herself. So she insisted she should get up and promised her she wouldn’t fall. Though the girl’s sister kept saying teasingly she would fall again, the little girl didn't heed but did as her dad had said. And there stood on her feet and walked to her daddy with no falls. What struck me in that scenario was what the little girl told her cheeky sister before she got up and walked. She said, I won’t fall because dad said I wouldn’t fall. She believed she wouldn’t fall once she stood up the way her dad had instructed. That was FAITH! While in church I began to link the little girl’s faith in her dad to the message of faith today’s gospel reading centered on and it was amazing how the girl’s faith could set her free from falling the third time. Today’s reading, John 2:1-12, is a call for us to reconsider the level of our faith in God. 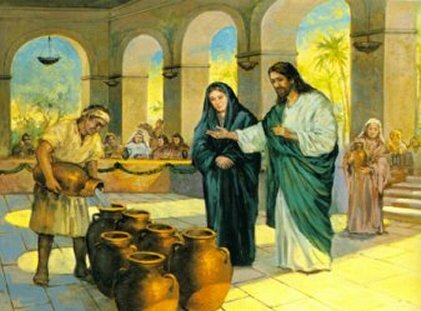 Before Jesus changed the water into wine, he had not done any miracles; people barely knew him or the significance of his mission on earth. But his mother, Mary, knew him and believed in him. Truly, it is surprising how she believed his son would do something when the wine was gone even though it was not yet his time. This is just a revelation to us of the extent having faith in someone can transform situations. Mary saying to the disciples, “Do whatever he tells you” is really a confirmation of faith in God. Today, we are reminded that there are blessings abound when we have faith in God. We saw how the wine turned out to be best of all the previous wines served at the wedding. And we can imagine how blessed the host, who did not know prior to the wedding who Jesus was, turned out to be. We are, therefore, called upon to mull over the blessings that will come to us when we invite Jesus and Mary to our events. Events do not necessarily mean moments of fun. Events represent various circumstances we are passing through in our lives. If we heed this call and come closer to him taking recourse to the examples, like we have been shown, representing the images of Christ’s behaviour in different shades of colour, we will be rest assured that we will never fall short of his blessings and promises. Even when we are not receptive of God’s calling, he honours our invitation.